We’ve spotted a few recent news stories questioning attendance figures and it highlights a question many event professionals have. Newham council said the average attendance at West Ham was 42,779 based on the 12 games it attended - which is 12,530 fans fewer than the club's season average figure of 55,309. The discrepancy comes because clubs tend to report the numbers of tickets sold, including all season ticket holders, rather than counting the actually people at a game. Similarly with events and exhibitions, there are variations in the way organisers report attendance figures and ticket sales. Sponsors and stall-holders assess the cost of their involvement based on likely returns, which is linked to the number of people who see and engage with their activity - so accurate attendance figures are important. However, we think that the real test is how many people had the chance to see your activity, what percentage of them stopped to find out more, and for how long. That’s where Exposure Analytics can help. 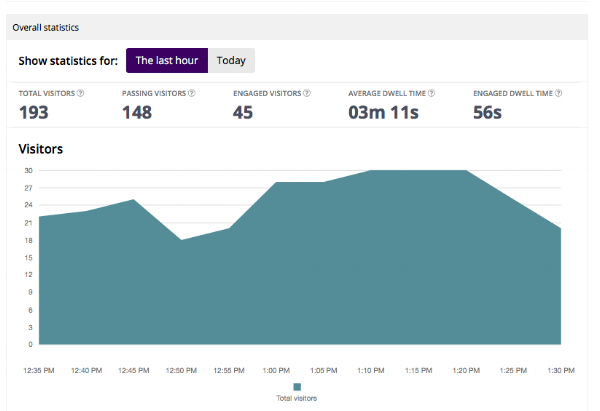 Our sensors provide exhibition analytics data and can tell you visitor numbers, how many passers-by you converted to engaged visitors, dwell time and engaged dwell time. We also produce heat maps and flow routes. Our systems can give you detailed data on how many people you welcomed, how long they stayed, heat maps to show popular areas of your stand, and flow routes to show how they moved around. Our technology, based on monitoring WiFi beacons from people's smartphones (anonymously of course), gives you the data you need to make sure you are making the most of your marketing budget. We’ve had clients at well-attended events who have used our data to either improve their stand layout or make more informed decisions about which events to attend. Get in touch to find out how we can help you to take the guesswork out of delivering brilliant experiences by providing the data you need to really evaluate the impact of your event.